Handrail elbows and couplers are curved components of a handrail that link two rails together, creating one continuous rail system. 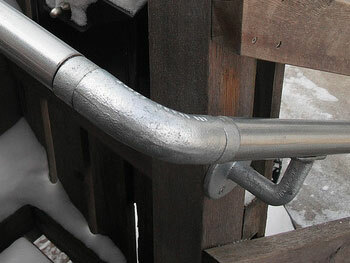 Elbows and couplers are used to connect multiple rails when there is an intentional bend or incline in a railing. In addition to our vast model selection below, we offer the choice of material, size, coating, texture, radius and finish. Gallery Metalworks also specialize in custom railing elbow design. Our elbow and custom coupler fabrication can be specialized to meet unique customer needs. Don't hesitate to contact us with design solution queries or questions.